Planning your honeymoon is a really exciting time, if you are considering St Lucia as your destination for some romance then you can’t go wrong. Strolling hand in hand along golden shores, sunset cocktails and some spectacular sightseeing is all waiting on this incredible Caribbean island. Rendezvous is a secluded, couples only, boutique resort perfect for honeymooners. Sparkling wine in your room on arrival and a complimentary honeymoon massage at the spa are a lovely welcome. If relaxing is top on the agenda spend the day floating gently along on the lazy river and find a secluded corner in the sunshine. There are also two further pools to choose from, one with a swim up bar, or step onto the golden sands of Malabar Beach and swim in the crystal clear Caribbean waters. For those who like to be active, windsurf, sail and snorkel until your hearts content or get energised in the gym. Retreat to your dreamy room with views of the ocean or tropical gardens, with no TV it is a tranquil hideaway. Celebrate in style at the Champagne Bar and dine by candlelight on the beach. Be as lively or as laid back as you like at Windjammer Landing Villa Beach Resort. Sip cocktails on the sun drenched beach, read under a shady palm, lounge by one of the three adult pools, or have a pedicure at the spa. If you are feeling energised and ready for some fun in the sun take full advantage of the watersports the resort has on offer, have a game of tennis or work up a sweat in the fitness centre. Rooms with neutral décor complement the azure blue views from the villas and private plunge pools will really make your honeymoon feel like a dream. Indulge in some local cuisine with a choice of restaurants; Upper Deck is all about steak and seafood with gorgeous views overlooking Labrelotte Bay. If you stay in a villa or suite there is the added option of In-Villa dining, have a personal chef prepare a sumptuous meal for the ultimate romantic dining experience. Anse Chastanet is a dream honeymoon location; it is the only resort in St Lucia that boasts views of both Gros and Petit Piton, the twin volcanic plugs that stand proudly along the west coast. Built into the lush green hillside this is a resort like no other, rooms with colourful Caribbean décor facing the lush gardens or the sparkling ocean along with views of the Pitons. 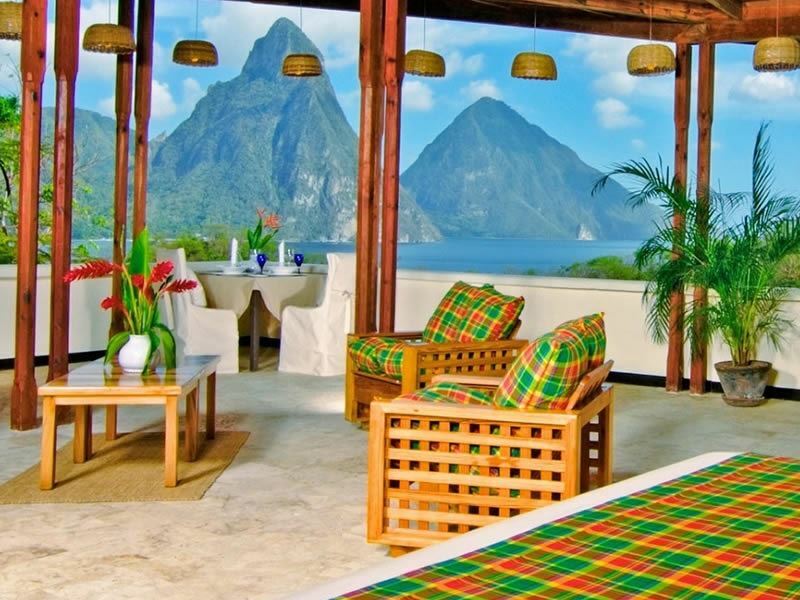 The Premium Hillside rooms have the ultimate view of Gros and Petit Piton and are very popular, some have their fourth wall missing so you can really immerse yourself in the incredible backdrop. Surrounded by a marine reserve dive into the deep blue water for out of this world snorkelling, swim amongst colourful coral reefs and tropical fish. 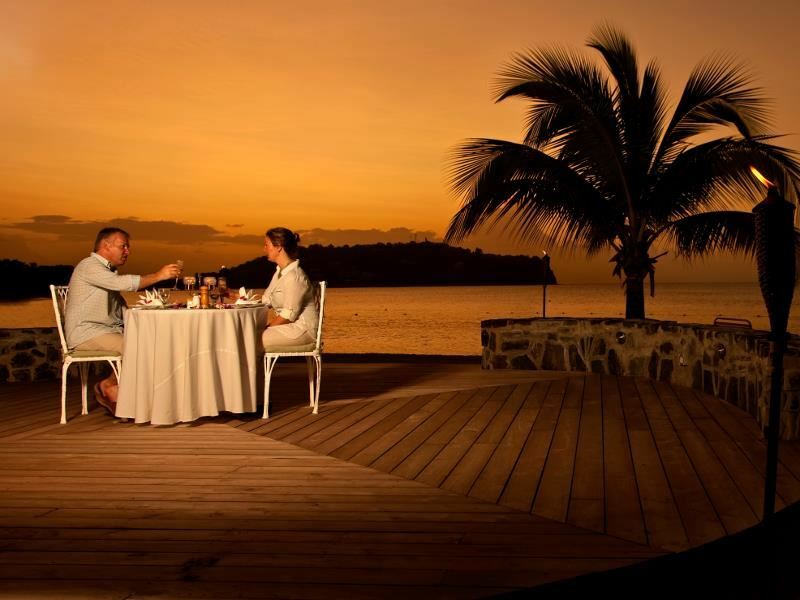 Dine at the open air Treehouse or for a really romantic evening have a private dinner on the beach. When it comes to looking after couples, Sandals have it all covered, specialising in all-inclusive luxury beach holidays. 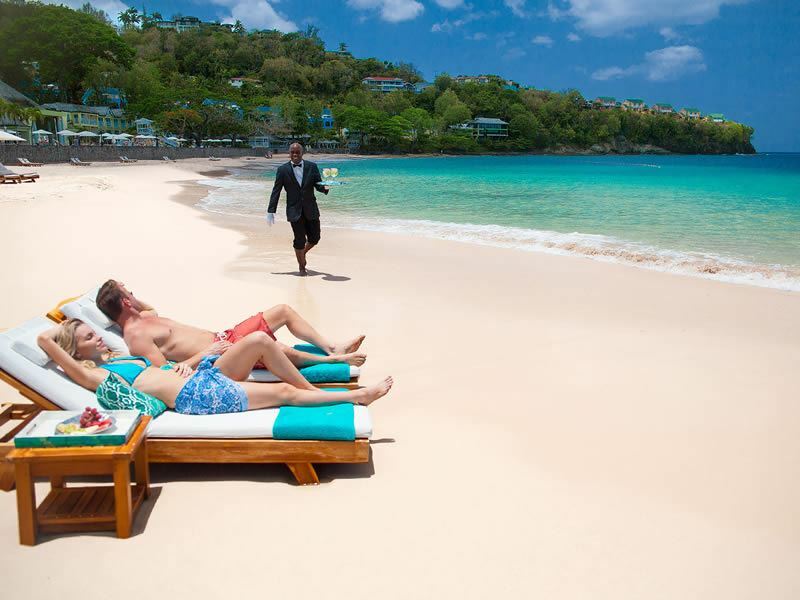 There are three Sandals Resorts hotels in St Lucia - Halcyon Beach, Grande St Lucian Spa & Beach Resort and Regency La Toc Golf Resort & Spa. 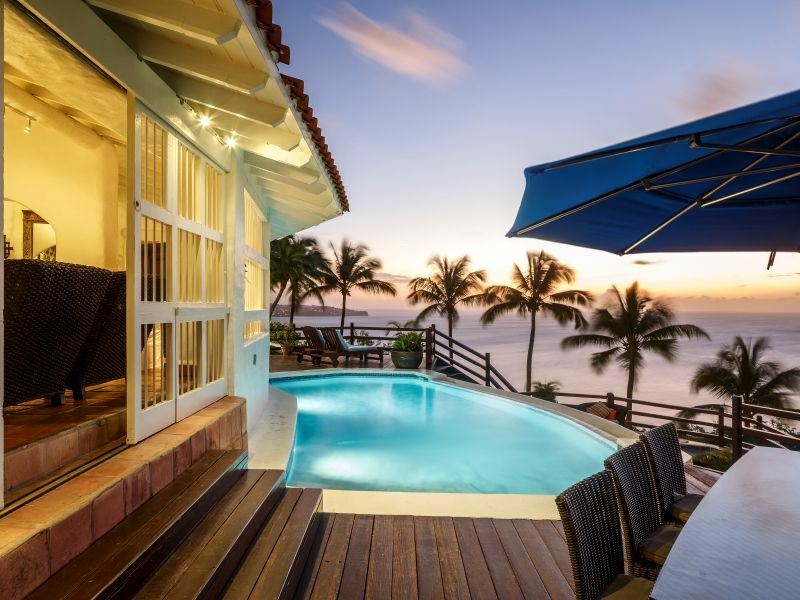 Villas with private pools and personal butler service, elegant two storey beach houses with access straight onto pristine, sparkling sands and swim right up to your bedroom in a Honeymoon Room at the Grande St Lucian. Romance is the essence of Sandals from spending time alone together in a private beach cabana, to sailing into the sunset and wining and dining by candlelight, whatever your needs are in paradise Sandals are sure to add the sparkle to your romantic break. If your honeymoon is all about relaxing then you are in the right place, incredible beaches with beautiful stretches of golden sand await. Anse des Pitons is a secluded beach nestled in between the Pitons, crystal clear waters and a backdrop like no other this picture perfect beach makes for a romantic retreat. For those who want to find adventure then you will not be disappointed, zip-lining is sure to get the adrenaline pumping. Pull on a harness and helmet and whizz through rainforest canopies. This is a unique way to see some stunning views of the island and have a lot of fun at the same time. For a more laid back excursion go on a dolphin spotting boat trip. The warm Caribbean waters are home to bottlenose and spinner dolphins, they are easily spotted cruising gracefully under the waves or playfully leaping out of the water; have your camera at the ready for these unforgettable moments. Boat trips consist of beach stops along with plenty of opportunities for swimming and snorkelling. Many are combined with stops at some top spots such as the sulphur springs and coco plantations. Head to St Lucia’s bustling capital, Castries for souvenir shopping, visit the fruit and vegetable market on a Saturday and stop at the craft market to buy spices and treats. To experience a local night out Gros Islet Jump up is a Friday night party like no other, the streets of this small fishing village turn into a fun night out, barbeques and bars set up along the tiny streets, and music plays until late, perfect for dancing the night away Caribbean style. For a decadent dining experience The Cliff at Cap is an experience like no other, each table has panoramic ocean views. The Rock Maison table is the best table in the house. Perched on its own wooden platform and surrounded on three sides by the ocean, drinks are delivered via a zip line from the bar, heavenly! 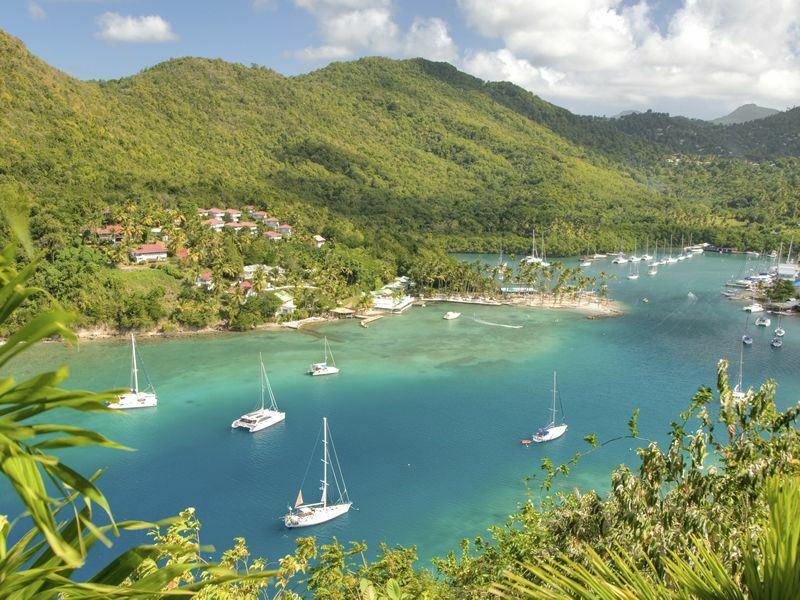 St Lucia is a honeymooners paradise with the perfect balance of relaxation and action. From lazing in a hammock on the beach to lounging by a pool with a cocktail. Or for those wanting a little more excitement from watersports to rainforest hikes and zip lining it’s all there waiting. St Lucia is an idyllic location to start married life together and a romantic getaway not to be forgotten.